Signed & numbered, limited-edition of 1000. Ring of Fire is available in 16 X 20 matted or 22 X 28 matted. Your choice of mat color. Let the paintbrush of Ruth's imagination propel you into lands where magic reigns supreme. In here are the paintings that have become the foundation of Ruth's work. From her earliest pieces to her latest oils, these pieces evoke powerful imagery that are fantastic on display. Beauty is truly one of my best pieces. Although she wasn't easy to create, I still feel very close to this piece. She is another in my twisted faerie tales, she is Sleeping Beauty. I have been asked if I will paint her, and I have decided not to. The black & white of pencil keeps her true to stark as she belongs. She is now available as an Open Edition. Image size is 17" X 26". Outer mat dimensions are 24" X 32.25". I haven't done a purely fantasy image in a bit. I painted "Bloodlust" with the intention of showing the classic Knight vs. the Dragon. We like to call him "Big Red", grrr...he's one nasty, scary critter! The image size is 14 3/4" x 22 1/2", with the final dimension for the matted size as 19 3/4" x 27 1/2". This is one of my older paintings, but still one of my favorites. It shows my version of a Templar Knight, with their 9 symbols in the windows of the church, the maltese cross, their motto on the reins in Latin "Dieu et les dames" which means "God and Womanhood", you can also see their coat of arms on his shield. I am continuing this story with the upcoming "Valor", look for it soon. This piece is now an Open Edition. Image size is 15" X 25". From Revelations Chapter 6, Verses 1-8 the Four Horsemen of the Apolcalypse upon their white, pale, red and black horses. My Four Horsemen are depicted from left to right--Pestilence with his Bow & Crown, Death with his scythe, War and his flaming Sword and Famine with his Scales, which is how food was measured. What can I say, I wanted them to rock and still depict the quote as seen in Revelations. This was one fun piece to paint and I truly pushed my envelope. Howl is the first of my twisted faerie tales. She is my version of Little Red Riding Hood, and she is one of my favorite pieces. I painted her in 1997, but I still do love her. There are 14 wolves throughout the entire piece, keep looking to see them all. Open Edition. Image size is 18" X 27". This is the second part of my Chessmatch Series, continued from "Checkmate" which includes "The Black King" and "The White Queen." Here I wanted to try to take the eternal fantasy elements of the Unicorn and the Pegasus and give them a new twist and the Knights seems to be the perfect match. This is a Signed & Numbered, Limited Edition Print. These two are the Black and White Knights. The third installment will be the Rooks- a Hippogriff vs. a Griffon. All artists want to portray a classical knight and horse piece and I really wanted mine to be romantic yet strong. I've chosen Lancelot, since he was one of the most complex of Arthur's knights. I loved painting his face, and you'll see I'm learning to work more painterly and loose. This is a piece I worked on at the 2009 Illustration Masterclass in Amerst, Ma. The image is available in either 16" X 20" (for ready-made frames) or 22 1/2" X 14 3/4". I've had this idea gurgling around for awhile- a deep wood, foggy and dismal, with ravens and wolves rushing through the trees, and an implacable sense of evil approaching--and "The Death of Arthur" was born. Here I've shown Morgana and her son Modred riding by the shields of knights they have slaughtered, on their way to the final battle with Arthur. The image is available in either 16" X 20" or 22" X 28"--both for ready-made frames. After drawing "Beauty", I realized I truly loved working in black in white. To me, certain pieces require a stillness that only pencil can bring. "Nimue" is my impression of the Children of Lir Irish tale. Her image size is 14 3/4" x 22 1/2", with her final dimension for her matted size as 19 3/4" x 27 1/2". Odin-The Allfather is available in 16 X 20 matted or 22 X 28 matted. Your choice of mat color. "Phoenix Dawn"...this piece was originally created for The Book of Angels for Barnes & Noble. But, I am a true believer in Worlds of Warcraft and our guild is The Phoenix Dawn, so this piece is perfect for us! Come and be with our Family, our realm/server is Gilneas, Come and be in our real world! I've always enjoyed trying to paint the archetype of the good metallic dragons. "Coppervein" was my first and now I present "Silverblood." Onto bronze or gold....I'm not sure which to tackle now. Silverblood is available in 16 X 20 matted or 22 X 28 matted. Your choice of mat color. 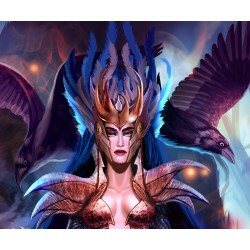 "Arcana: The Druid" has 2 image sizes available. The Arcana Series is how I wanted to explore the incarnations of magic. The Druid depicts the Celtic approach to natural magic with--the Horns of Cernunnos, his torc, the holly & mistletoe he holds, the Horned Moon & Celtic Tattoos he wears, his black black wolf and his raven. Final matted size is 10.75" X 19.50" Larger size is: 16.75" X 30.25"